Sometime referred to as the "monkey faced owl because of it's heart shaped face, the barn owl is one of the most widespread of all the owls and can be found on every continent except Antarctica. It is a medium sized owl of between 13 and 20 inches in height with a wingspan of 2-3 feet. The female is slighty larger with a longer wingspan. 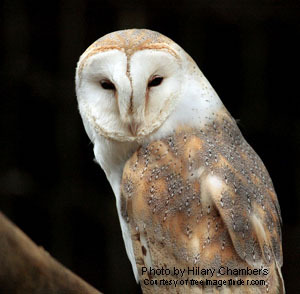 Like most owls, the barn owl is a nocturnal hunter with remarkable eyesight, yet locates most of it's prey by sound. Their heart shaped face funnels sound to their asymetrically position ears on their head, giving them an uncanny ability to pinpoint prey by ear. Their specialty is small ground mammals or rodents like field mice, rats, shrews and gophers. Their diet also includes baby rabbits, frogs, bats, birds and insects. Barn owls get their name from their nesting habits which tend to be old barns, uninhabited buildings or hollow trees near open grasslands or farm fields. Because they are cavity dwellers barn owls are good candidates for nesting boxes. They breed any time of the year depending on the amount of food available. When things are good they may breed twice during the year. Females lay between 3 and 6 eggs ( sometimes as many as a dozen )which take a month to 34 days to incubate. The white down covered chick remain in the nest until they fledge 55-65 days later. Most typically lives for only one or two years. In Native American culture, the Hopi indians considered them to be taboo, and tied to sorcery and evil. A single family can consume over 3000 mice or voles per year. They respond to higher rodent numbers by producing more young per brood, and more than one brood per year. They will use the same nesting area year after year with new owls replacing older owls after their death.